Do you feel like you’ve look everywhere for your next home and haven’t found it? Click here to check out our homes for sale coming soon for exclusive homes that are not listed for sale, but are available for purchase! At the EdConstable.com Team, we want to make your dream of owning one of the fantastic waterfront homes in our area a reality. The Fenton area has several great lakes to choose from, each with their own features and differences. With so many lakes to pick between, finding your dream waterfront home on the perfect lake can happen easier than you think! Whether big or small, all-sports or no-wake, private or public access, or any combination, we can help you find the perfect lake for your lifestyle! When first considering lakefront homes in Fenton, most minds instantly think of Lake Fenton, which can be thought of as the crown jewel. Lake Fenton is often considered the most desirable lake in the Fenton, Michigan area for a several reasons. An obvious reason would be its size; Lake Fenton is the largest lake in Genesee County, measuring approximately 845 acres. Lake Fenton also has a very convenient location close to US-23 and is only a few minutes from I-75. With its strategic location, it is a great place to live for commuters who work south of Fenton such as Clarkston, Waterford, and the other Metro Detroit communities. It is also a very short commute for those who work in the Flint and Grand Blanc areas. Residents of Lake Fenton have the benefit of great education systems for children and a fun and active lake with many events year round. Lake Fenton has a public access point and is an entertainment hit during summer holidays. If you want to live on a different lake in Fenton, Silver Lake is also a great option. It is nice in size and connects to all sports Marl Lake. What makes Silver Lake and Marl Lake great is that they do not have a public access! The private lakes allow for a strong lake community and fewer disturbances. Some other benefits of Silver Lake is that it is a very deep and clean Lake. There is a public park on Silver Lake where you can go and sometimes catch a glimpse of the Silver Lake ski team doing tricks on the water. Silver Lake also has a great location close the expressway and is very close to shopping. If you are looking for a little more value in your home, Lake Ponemah is the place to search! Although Lake Ponemah is not as large as Lake Fenton and Silver Lake, it is still a good size and offers public access. Lake Ponemah connects to Squaw Lake and Tupper Lake. Another cool feature of the Ponemah chain is that the Shiawassee River inlets by the sand bar and exits through Tupper lake. People have been known to kayak all the way from the downtown Fenton Millpond to Downtown Linden! These three lakes have beautiful waterfront homes and some very nice neighborhoods. The houses of many of Fenton’s millionaires are in some of these neighborhoods, such as Emerald Pointe and Liberty Shores. Are you interested in owning a waterfront home on a large chain of lakes? The Lobdell Lake chain would be a great choice. Most of the Lobdell Lake chain is 7-12 minutes from the expressway and other conveniences and neighborhood amenities. Lobdell Lake measures about 538 acres, and going under the bridge brings you to Bennet Lake, where you can weave through the marsh to get to the beautiful and under-developed Lake Hoisington. These lakes have gorgeous natural shapes that provide incredible shoreline views. Waterfront homes and lots with mature tree coverage and privacy can be found on one of these lakes, where you can achieve a peaceful waterfront lifestyle. Fenton and Linden also offer many other all sports lakes such as Loon Lake. Loon lake has a great location, but it is a shallow lake and not great for wake boarding. Right on the other side of Jennings Rd is Crane Lake. Crane Lake is also an all sports lake, but it is smaller than even Loon Lake. When buying waterfront homes on Loon Lake or Crane Lake, you can get more house for your money because of the smaller sizes of the lakes, but still get to enjoy beautiful lake views and calming water sounds throughout the year. If you want to live in south Fenton, Runyan Lake can be an excellent option. Runyan Lake has a strong community of residents that love their lake. They have a couple organized event on Runyan Lake every year, making it a fun place to live. There are several other small, no-wake lakes with waterfront homes in the local area. No-wake lakes can be superior for fishing with no fast motors speeding through, and once again still offer the beautiful scenery that comes with owning a waterfront home. 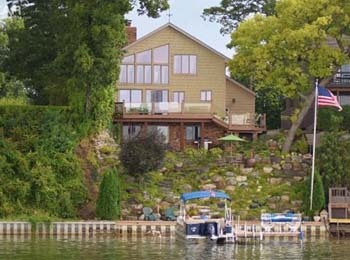 If you are looking for waterfront homes for sale on these or any lakes in Michigan, the EdConstable.com Team can set you up with a custom search that send you homes for sale on the lake you want to live on as soon as it hits the market. 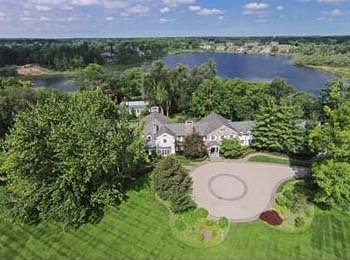 Ed Constable is a Fenton waterfront home owner himself. Having spent time on most of Fenton’s lakes, he knows about the intricacies of each lake and loves to help others find which lakes would meet their ideal lifestyle. If you are looking for waterfront homes, you have come to the right place to gain knowledge about each lake and find the perfect lakefront community to buy a home. All of the different lakes throughout Fenton, Linden, Howell, Holly and the rest of the state have so much to offer. To help the buyers who have not already decided which lake to live on, please take the time to make a comment below on what you love about your lake in Michigan! Also, if your lake has an event coming up that you would like people to know about, please leave it below and we can add it to our event calendar. Lake communities are a big part of our local area, and friendly relationships with neighbors are a fun part of lake living!